There is a cat in my yard! The world is divided into two types of people, cat lovers and dog lovers. Occasionally you run into someone like myself that like both. Each animal has its own charm, the loyal dog and the fickle cat. Cats can be pesky, especially when they are feral. Feral is the term for an animal that has escaped domestication and now roams free. The debate over what to do with them isn’t going to be settled soon. Not all cats that show up are feral. Some cats that show up likely have owners that prefer to let their cats roam. Other cats may come into your yard too. These cats, meant to be wild, can also cause some problems. Most common of these would be a bobcat. Usually they steer clear of humans but the scent of pet chickens or rabbits may draws them in closer to human activity. Less common might be the Florida Panther. A rare species of Puma that is becoming more abundant in Florida. Putting out food for birds makes for great bird watching. This cat enjoys watching too! Once that you’ve caught a cat, you now have another problem. What to do with them? If you spay or neuter and release them you will curb the number of animals in the area in the future. There are programs in place, which local veterinarians work with non-profits to do this work at no charge or for small a donation. One of the cat’s ears is generally clipped to let animal control know the cat has been altered. This practice may or may not help the cat, since animal control rules likely require the cat, if trapped by them, is to be brought in regardless. Check with your local animal control to see if this is the case. Some people believe, even though this is a humane way to deal with these animals, feral cats left to run free without immunization for certain diseases are a health concern. You may also want to take into consideration the effect they have on native wildlife too. 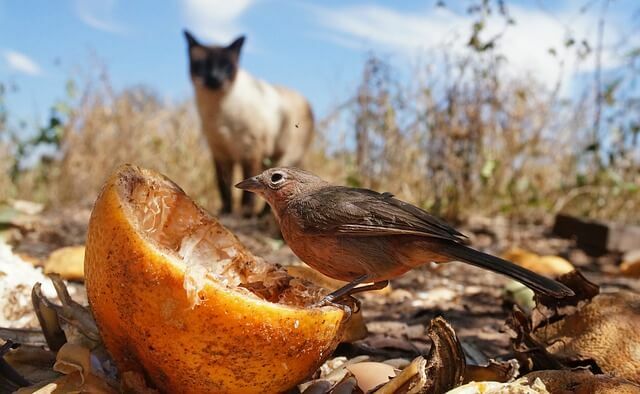 Cats are one of the major predators on wild bird populations. Feeding birds and concentrating them in areas of your yard may leave the birds at a disadvantage when cats come calling. Another option is to take the cat to the local animal shelters. Shelters that re-home cats will not want them if they are not domesticated and they possibly will end up euthanized. 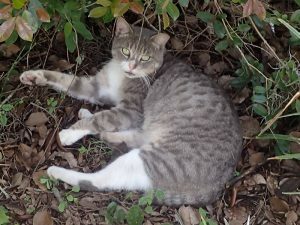 Trapping them and moving them to other neighborhoods, while being a solution for you, unfairly places the burden on another area and exacerbates the problem of producing larger feral cat populations. If you like cats, and are of a charitable nature, you may have the animal altered and try to domesticate it for yourself. Whatever option you choose. Having the animal spayed or neutered is the minimal you should do with any animal you plan on caring for and do not intend on taking to a shelter. That’s the latest from your hometown gardener. Stay tuned for more information on bobcats and panthers on later Blogs! I’m David Austin, your Hometown Gardener. David Austin is a UF/IFAS Extension, Residential Horticulture Agent and Master Gardener Coordinator in Highlands County, Florida. Follow him on Facebook on his Hometown Gardener Page.